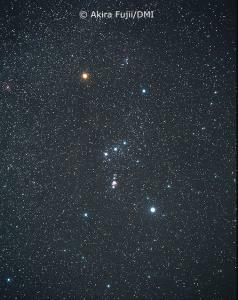 Orion, the Giant Hunter - The brightest and most recognized of all constellations, Orion is seen in winter skies, rising in the east at sunset in January and dropping behind the western horizon in the first week of May. 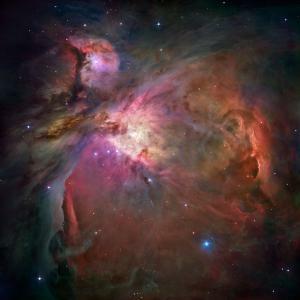 Orion is home to the magnificent emission nebula known as M-42, roughly estimated to be 17 light-years across lying approximately 1,500 light-years away. Image by Akira Fujii used by permission from David Malin Images. The AOAS 2007 public observing events kick off on Friday evening, February 9, 2007, with the first of four scheduled public viewing events at the Janet Huckabee River Valley Nature Center. We call these special events in cooperation with the Nature Center our "Stars in the Natural State" and the public is invited to attend. Our other three events at the Nature Center for 2007 will be held on May 11, Sept 14, and Dec 14. Make plans to attend all four events, and you will experience four different quadrants of the night sky, and have an opportunity to see all 50 or so northern hemisphere constellations. AOAS is very proud to announce a year-long collaboration with the Janet Huckabee River Valley Nature Center located at 8300 Wells Lake Rd in Barling, AR. Borrowing from the Arkansas State motto, we call these public nights our "Stars in the Natural State" viewing events, all of which as always begin at dusk no matter which of the four seasons in which they'll be held. Setting four events with one for each season gives our visitors a unique opportunity to see all the northern hemisphere constellations by simply attending each of these events. With this first event, you'll watch mighty Orion as he fends off the mythical attack of Taurus the Bull, while slowly switching from the eastern sky to the western sky between this first event and the May 11 event. Of course by that time the eastern sky is seeing an entirely new set of constellations rise and take their turn at making the same stately trek across the vault of the night sky, this time bringing with it a giant number of distant galaxies scattered through the constellations of Coma Berenices, or, Bernices Hair; Canis Venatici, the Hunting Dogs; and Virgo, the Virgin. Literally hundreds of faint small galaxies are within the reach of medium or large backyard telescopes, and a dozen or more galaxies are bright enough to view in even small telescopes. Our observing events are learning experiences. Seeing several dozen constellations are a favorite request from our guests, as are the inevitable questions of "What planets are out? ", and "Where are the Black Holes? ", or "Can you see the [American] flag on the moon?" Our members are very happy to show whoever might ask them ANY THING they want to see, up to a point, that is. The flag is NOT visible to any telescope, ground-based or space-based, period! We simply do not have the technology to see something that small on the moon. Will it always be that way? I wouldn't want to bet on that. And Black Holes? Well, by definition, they're black, and they can NOT be seen directly. We know they exist due to the evidence we see in objects where something unseen exhibits some gravitational influence on a separate visible object and thereby revealing itself. Thanks to our club's membership in the Night Sky Network, we receive periodic toolkits containing simple components which are very effective at helping us explain such difficult, or abstract ideas. Come and visit us at one or more of our dozen-plus planned events this year. You are guaranteed to see things you've never seen before and even things that you may never have known you even COULD see.